My internets. Take them all. PhoenixRising wrote: EDIT: I just have to ask, what language is that message in your sig in? ..really? XD I thought it was some "geek language," Elvish or Klingon or something like that. Now I feel like a noob. Damnit, now I can't stop laughing! I'd be shocked if the mods even bother with this thread anymore. They may be letting us go, planning to use this thread as a test environment for future moderators. Those who pass that qualifying test, get to take the test again with the MADNESS turned on to see if they can be driven insane by the users. Those who are driven insane are given modprivs. Those who stay sane are permabanned. And the lucky few who go insane even before the MADNESS is activated receive adminprivs and a TARDIS. FTFY, given the nature of our current mods. And this is why you're the..wait, what was your title again? Something about graphics. Anyway, nice job! I think it's [something something] Staff of [something]. lmjb1964 wrote: Though I don't know why my post looks so funny. Why's my sig and avatar spacing all wonky? What did I do? I figured it was a rot[n] of some sort, but was too lazy at the time to decode it. I suppose I'm a n00b too. lmjb1964 wrote: At any rate, this doesn't really affect the idea of The Castle Era and The Scaffolding Era, since it's all happening during the Scaffolding Era. If it turns out to be a flood, then within the Scaffolding Era we can have Pre-diluvian and Antediluvian Epochs. I'm not sure you didn't do this on purpose, but, 'pre-' and 'ante-' both mean 'before', so those would be the same thing, taken at face value. [facepalm] Oops. I knew that. I was so focused on trying to come up with a joke using "anti-diluvian" that I went and used antediluvian wrong. Thanks for setting me straight, KarMann. Of course, I could go back and edit my earlier post to say "Antediluvian and Post-Diluvian Epochs," and then I could have been all like, "What are you talking about? I totally used it right!" cmyk wrote: I figured it was a rot[n] of some sort, but was too lazy at the time to decode it. EDIT: I stopped being lazy long enough to go look it up. I haz citation now1. Last edited by PhoenixRising on Thu Apr 18, 2013 12:05 am UTC, edited 1 time in total. oh, never mind, someone ninja'd me. ETA: 50 posts! My golden post! I think it might be dialogue. [quote=Past Smithers]I, Past Smithers, hereby pledge allegiance to the One True Comic, to the Magnificent Lord Randall and to the Thread Of Time. I swear to defend all those who wait for it, regardless of religion, preferred nomenclature for the time between frames or predilection for paradoxen or ebg68. you haven't thought of a knightly name yet, have you? Maybe by the Time you get to the present, you will have. Welcome to the Knights Temporal, Good Sir-To-Be-Named-At-A-Future-Time! Last edited by StratPlayer on Thu Apr 18, 2013 12:09 am UTC, edited 1 time in total. Rot13, performed twice, returns the original text. If I understand correctly it's basically a "lazy man's ultra-easy cipher." :smack: Never occurred to me! As long as you were top o' the page when the newpage formed (i.e. when there was only one post on a page, it was yours), you're that page's Pope, assuming you haven't been temporary Pope in the past 24 hours, regardless of bumps (from moderator-filtered newbie posts) or deletions. I'm surprised people, including myself, are still following this. By now it's obvious that Randall has just massively trolled us, and we'll be glued to the site for eons. The rightmost small tower will collapse into the sea at 695. Excellent! * I commend you on your master-punnery!!! Roia wrote: The scaffolding + rising sea basically trashes any loopist therories. I mean, if the comic were to loop, right now it would require there to be an entire level platform of sand, else when the loop happens and they walk off screen, they'd basically be walking... off the scaffold. That would hurt! 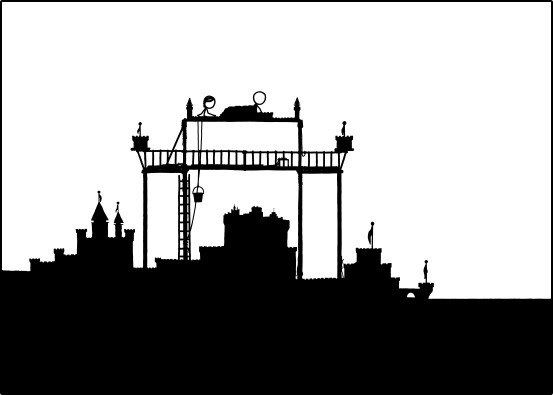 And unless they could haul up the entire beach onto that scaffold, they wouldn't have enough building material to reconstruct the castle to this scale. Of course, this only makes sense if the comic intends to have a loop-that-makes-sense. It could just go back to the first panel and just start all over again without a logical loop. But that would somehow feel wrong. I'd rather it just END than end in an illogical loop. I guess I just made myself a non-loopist. I posted one idea earlier where they could build a smaller beach on the platform. And then bring in 2 mini stick figures of themselves and start top motion animating them. Camera zooms in and we loop. however the real problem with this is that after several loops the miniature size will cause problems. Would be cool if it got lower res as it started hitting the size of atoms etc. You know, this new system of Papal appointments is inane, ridiculously arbitrary, and prone to errors. It makes absolutely no sense and causes nothing but chaos and confusion. All salute the Pope Pro Tempore! Something got messed up with the quoting. It's happened to me before. The way I dealt with it is removing part of the quote. Ha. This is actually pretty funny / cool idea. Although the sea rising would be considerably faster once you got down to atoms, seeing as they can't miniaturise the ocean. Perhaps they're actually making the sandcastles out of the sea itself, and have some kind of magical freezing-the-sea-to-build-with-it ability. And when the non-frozen-sea touches it it dissolves. Then, once it gets level, they can just do the same thing and create the loop. It wouldn't account for the repetitive conversation though. If there's nested quotes and spoilers involved, especially if one of the spoilers contains more nested quotes, it can screw things up big-time. Just snip stuff you aren't responding to. I did a quick look back through the last few NePages and I didn't see where anyone's mentioned this, but is the tower on the right of the top platform that Cueball made supposed to be a silhouette of this??? Another riff on "Time" by Lord Randall??? Poping is somewhat willy-nilly around here. I CAUGHT UP!!! And probably all of the Quote responses I had been keeping are TOTALLY (Like totally, like it's soooo bitchen) irrelevant now. But I probably won't let that stop me. Upper scaffold, bottom of right leg, strange little loop thing at the railing. Is that rope? I once thought it was homage to the original 13 American colonies--which used to be a lucky number. I was sad to learn the Alphabet had 26 letters and rot13 moved them exactly halfway round--or as far from the original letter as is possible, making it just as easy to crack. And was sadder to notice I was studying cryptography before making any serious recognition that the alphabet had 26 letters. * Side-note: I've always been a little school-boy partial to the Vigenere Square. That grid is just beautiful! Edit: I once coded a cubed version of the square which shuffled just like a Rubik's cube, based on the key. Plotted the cipher based on 3D coordinates. I wish to Randall the Almighty I knew how to view a graphic representation of that action a la Swordfish. Last edited by Mycroft_147 on Thu Apr 18, 2013 1:08 am UTC, edited 1 time in total. Thanks, you are too kind. Luckily, the Popeship has now passed on to someone else, and I can go back to being a lurker who occasionally posts. They may be letting us go, planning to use this thread as a test environment for future moderators. Those who pass that qualifying test, get to take the test again with the MADNESS turned on to see if they can be driven insane by the users. So, how many threads do you think this would need to be split into? boozledorf wrote: Is this some sort of origin story for the world?? elementropy wrote: Given the way the dialogue seems to show two people trying to understand the particular geographic and weather phenomena of their surrounding environment, is anyone else finding themselves reminded of The Hunger Games? Mycroft_147 wrote: Upper scaffold, bottom of right leg, strange little loop thing at the railing. Is that rope? I believe you're mistaken. If we are to take the 2003 Battlestar Galactica reboot as a literal analogy for US history, then there were actually only 12 original American colonies... and the 13th colony was a post-apocylptic wasteland populated by humanoid Cylons with a Bob Dylan fetish. Last edited by vvn on Thu Apr 18, 2013 1:19 am UTC, edited 1 time in total. Last edited by chem1190c on Thu Apr 18, 2013 1:27 am UTC, edited 1 time in total. Do they count as Americans? Can an eventual evolutionary social subset be counted among an earlier set? I don't know, you may have an excellent point. Either way, one day we maniacs are finally, really, going to do it. We'll blow it up! And some day someone is going to damn us all to hell for it. You're talking about South Carolina, right? Also, I just Pope'd myself. ...if I could have a crenellated hat. Argh #3! Really stalling, now. Looks like nobody's ready to be PFAP. At this rate, buffygirl'll be back before I post. Aha! Ten minutes later, I can post! All hail PFAP Asthanius! You've made that sort of comment before, at least if my memory serves me correctly. And the 9000 series is the most reliable computer ever made. No 9000 computer has ever made a mistake or distorted information. We are all, by any practical definition of the words, foolproof and incapable of error. Wow, I coma'd through at least 6 NewPages, but I'm finally back in the present again. silent_death wrote: What I am actually much more surprised about is how fast the Castle erodes because of the incoming tide....the very narrow (possibly infinitly into 2D space reaching) dike she built did hold up the water for a very long time, and the castlewalls seem to be crumbling as soon as the water touches them. Maybe Megan mixed the sand with superglue? StormAngel wrote: Wow, I coma'd through at least 6 NewPages, but I'm finally back in the present again. 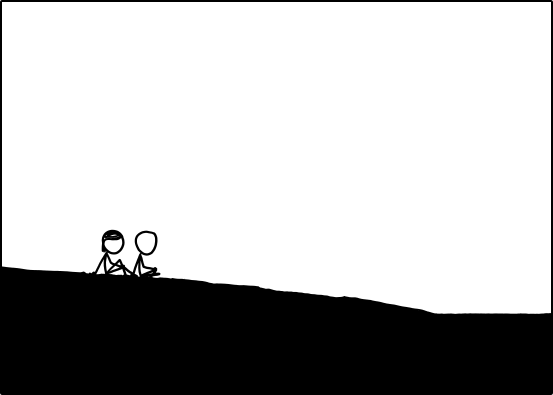 xkcd has its own logic that is combined in strange yet sometimes predictable ways with Outsider logic. Officially, my official view is that the only official view is Randall's official view. Also, HAL, I seem to believe that I was given the title of PFAN by you, and thus did not actually earn it. You, on the other hand, did earn it at one point.